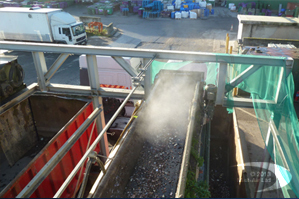 A bulk front loader working in a biomass yard. 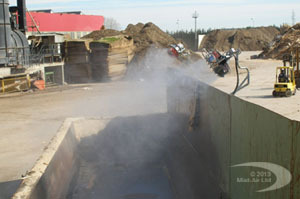 Personnel and equipment are protected from dust by mist-air and stock pile material remains dry. encroaching on the nearby working environment. 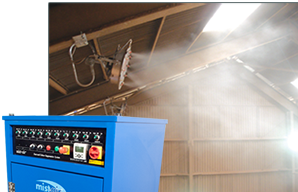 Air polluting dust is prevented by mist-air from escaping this hopper and contaminating the yard and surrounding countryside. *Fog is simply atomised H2O which mearly increases the air's humidity. When used as directed, it is dry to use in that it does not wet floors, materials, machinery , or personel.